I don’t think it’s a coincidence that the acronym for these babies is MMM, because that’s all you’re going to be saying once you get a taste! 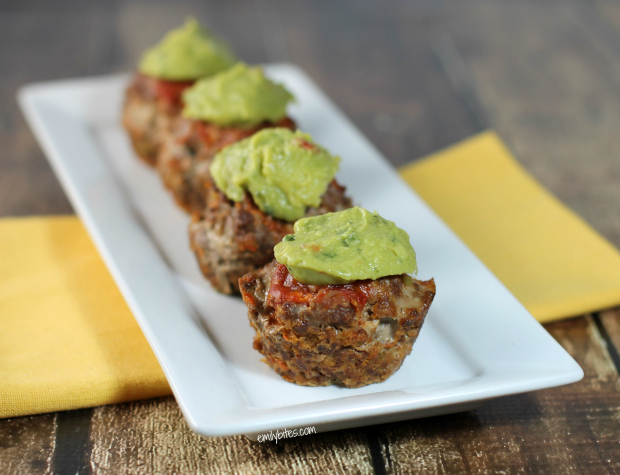 These hearty little Mexi Meatloaf Muffins are absolutely packed with spicy Mexican flavor, which is perfectly balanced with a cool, creamy guacamole topping. Y’all know I love making all kinds of main courses in my muffin tins , but I think meatloaf works particularly well this way. It’s great for portion control (I usually eat two as a main dish), kids and adults both love it, and it cooks up faster than a traditional loaf, making it an easy, tasty weeknight meal. Plus it’s easy to grab the leftovers for lunch the next day. I’m happy to announce that I’ve partnered with Sabra (one of my favorite brands and maker of the all-time best hummus, Roasted Pine Nut…yum) to develop recipes as part of their 2014 Tastemakers Panel*! While I’ve been a huge fan of their hummus for years, I hadn’t realized that they also make veggie dips, salsa, guacamole and other tasty spreads and salads like bruschetta topping (my fiance’s absolute favorite). Sabra sent me a selection of products to try and I was immediately drawn in by the super fresh taste and chunky styles of both their salsas and guacamole. I developed this recipe around those two ingredients and I really couldn’t be happier with the results! Wondering which stores in your area carry the Sabra products I used? Try this store locator on their web site – just type in your zip code and it’ll show you which product categories are carried in the stores near you. *I have partnered with Sabra as part of their 2014 Tastemakers Panel. I have been compensated for my time commitment to work with their product, however my opinions are entirely my own and I have not been paid to publish positive comments. Pre-heat the oven to 350. Lightly mist a 12 cup muffin tin (affiliate link) with cooking spray and set aside. In a small skillet, bring the chili oil to medium heat. Add the onions, carrots and garlic and cook for about 4-5 minutes until vegetables are softened. Remove from heat. Combine the salt, black pepper, cayenne, oregano, paprika, cumin and chili powder in a large mixing bowl and stir together. Add the softened veggies from step 2, salsa, eggs and bread crumbs and stir together until well mixed. Add the ground beef and work together until combined (I use my hands for this step). Divide the meat mixture evenly amongst the 12 cups in the prepared muffin tin. Drizzle a ½ teaspoon of taco sauce over the top of each muffin. Bake for about 25 minutes until cooked through. Allow to cool for about 5 minutes. 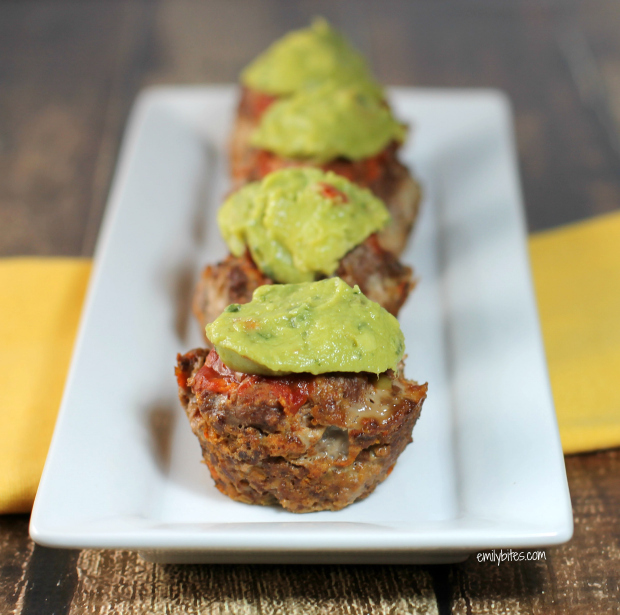 Top each meatloaf muffin with 2 teaspoons of guacamole and serve. These look amazing. That guac on top is calling my name! You’ll have to try them, they’re so good! Oh my goodness. I just made these and they are SO FLIPPING GOOD! I didn’t even put the guacamole on top (forgot to buy some…) and they are spectacular without it! This is going to be a regular in my lunch bag. Thanks for another awesome recipe! FABULOUS recipe! I didn’t have any chili oil, and I even made my own so that I could follow your recipe exactly. And I am glad that I did. My husband and I each stopped at 2 each, but we could have had several more because they were that good. Keeping this in the rotation – and get the guac on top, because that made them even better. Thanks, Emily!!! These are great. Loved them. Very easy to make. Didn’t have guacomole so I used some fresh avocado it was great. Can’t wait to try. It’s on my meal plan this week! 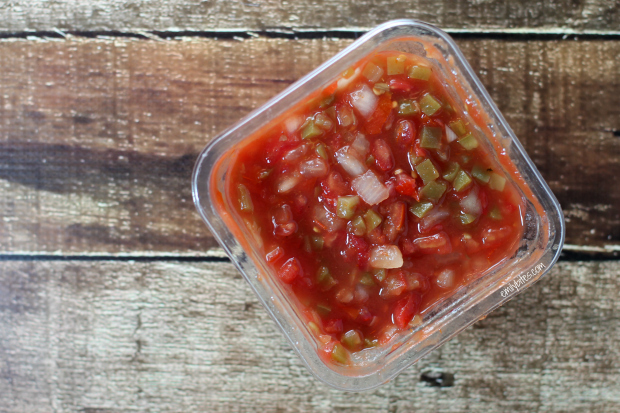 I’m loving sabra’s salsa! I can’t wait to give this a try. These were so delicious! I have a tip for people who don’t have chili oil or can’t find it. I didn’t have chili oil so what I did was put 1 teaspoon of olive oil in my saute pan and I add a squirt of Siracha (Chili sauce) to it and stirred it around well. It worked perfectly! I used 1/2 cup of uncooked oatmeal (4 points instead of 6 for the bread crumbs) and they were delicious! Question, what is taco sauce? Brand? Any tips for storage and reheating? Wow! These were unbelievably delicious. I have tried other “taco muffins” and these were so much better. I live in Texas and we love our Tex-Mex, so I need something with spice and flavor and this did it for me. I couldn’t find the chili oil, so I did what someone else said and mixed a little sriracha sauce with some olive oil. I do not like carrots, but I couldn’t taste them in these. I messed up because I only had 1 lb. of meat instead of 1 1/2 and I used the same amounts of the spices etc, and they turned out so good anyways. Next time I will make sure to buy extra lean too, because they were greasy (my fault). Thank you Emily!! These are going to be a staple for my house! I’m so happy you loved them! Thanks so much for letting me know. Glad to hear sriracha + olive oil does the trick! Holy flavor of goodness.. I made them last night for dinner (a big hit) and enjoying 2 more for lunch today. I don’t consider myself a ‘cook’ but this creative meal makes it seems like I know what I’m doing..thank you for this awesome meal!